Bridge design pattern is a modified version of the notion of “prefer composition over inheritance”. When there are inheritance hierarchies creating concrete implementation, you loose flexibility because of interdependence. Oops! these kind of sentencies shows that the author(I) didn’t understand and tries to escape! Okay, I will decrypt this sentence in the coming paragraphs. 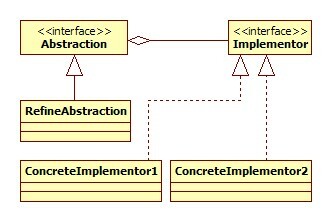 Decouple implentation from interface and hiding implementation details from client is the essense of bridge design pattern. Comments on "Bridge Design Pattern"
Thanks for your work. neat explanation.. I really like your simple way of presentation. I am following your articles and will definitely come back whenever I need a quick refresh of the topic. Bridge Vs Abstract Design Pattern? Bridge Vs Adapter Design Pattern? Please do explain the difference between Bridge and Abstract Factory. Although I am very new to class designing concepts, the pattern explained above was very clear to me. Is it right to add our name and the bug number when we do bug fix in java class or jsp files? Keep on going you rock. !!! Simplest explanation of Bridge Pattern I have ever read. Great Please keep writing. Really happy after reading this article. brilliant brilliant.. i really understood bridge pattern by looking at the before and after images.. thanks so much!! above innerclass following which relationship in java? HJ…simple and clear. give more examples on when to select this pattern. sir , you have written it so clearly, one can quickly get it , thankyou so much. Thanks for the neat explanation on this. 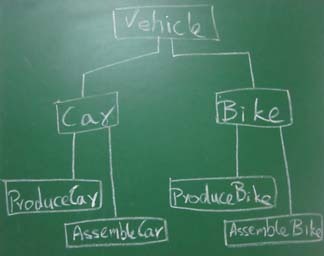 I like the pictorial representation (vehicle – workshop), But I didn’t find example description. Can you add few lines describes on this diagram? It does not seem logical that Vehicle has WorkShop. Instead I would have created a new Object of Produce and Assemble in manufacture function and called their work function with this as the argument. Can this be refined to be more clear?. I feel that the way we produce and assemble car and bike would be totally different. Please correct me if I am wrong. I agree with Ankur. May be you can give a differnt example. In this example, I would also say that we create a Car or a Bike separately which implements Vehicle and pass it to the Workshop which accepts Vehicle type objects in its constructor. Your example is wrong. Workshop HAS-A Vehicle, not the other way round. its really an excellent one. your work is very simple and understandable, thank you for your brillant work. I see you use WordPress, your content definitely deserves a better theme. From this example the utility of bridge pattern is not clear. You have used same method to produce both car and as well as bike. Which is never a feasible option. You always need a different workshop for producing two different types of vehicles. Same holds for assemblers. Pardon me for this comment. We need a better real life example for this design pattern. Its very easy to understand..Thank u very much. Hey Joe, thank you. I liked your “before” and “after” chart, that was very insightful. Very good article. I Loved the use of simple examples to explain the patterns. Explanation is crystal clear, content are awesome. Lots of praises for you. But the composition, Vehicle HAS-A Workshop does not suit here as a real life example. It should be other way around. Please explain or modify the example. oh joe, u made my day … Never ever found simple sentences explaining design patterns. A Car or bike can be either produced or assembled. From your example I see that we are passing 2 different implementations to the constructor of the Refined abstraction (Car and Bike). In you test class BridgePattern you have instantiated a Car and Bike using the Abstraction class Vehicle. Also, the manufacture method is invoked on both the cases. What I do not understand is. How will I be able to change the implementation(manufacturing) from say assembling to producing or to something new. Also, After I make that change how will I be able invoked it from the Test Class, without impacting the bike and car classes. Thats true, i am C guy moving to C++ after many years working on C.
Though all the examples are in java, i am able to understand all the design patterns. For a quick reading and grasping the concepts, these blogs are very useful. The core concept of this pattern has not yet been given by your explanation. Not only by you, even in GoF book also the same. Bridge pattern says that decouple an abstraction from its implementation so that the two can vary independently. If either abstraction or its implementation or both will be changed, what would be result is not given. I feel the clarity or preciseness of the content is missing. Could you please take extra care in specifying relationships. ex: After bridge pattern example of car, bike produce. Inheritence and composition is not specified clearly. Vehicle, workshop example can be solved easily using Strategy pattern and IMO, strategy pattern is the best fit for this problem. I’m still trying to understand where can bridge pattern be applied. Anyone demonstrating it with good example will be a great help. Excellent article !!! Many thanks to you !!! Joe, though the definition of Bridge pattern is right but I have concerns over applicability of this pattern on the cited example. 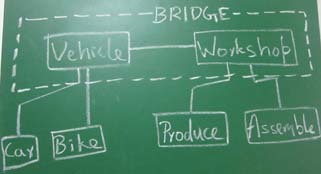 In your whiteboard diagram for “design before bridge pattern”, the purpose of creating two subclasses of car: ProduceCar & AssembleCar is not clear. It would be better if you can explain the example properly. Without understanding why would that design was done in first place, it’s very difficult to appreciate the application of design pattern on this example. Comments are closed for "Bridge Design Pattern".